Have you ever slept on a train or in a tree house? Traveling should ensure a sense of wonder, time to wander and the feeling of accomplishment. My grandson and I nailed all three this summer while speeding across the Midwest and camping deep in the Shawnee National Forest. A stopped freight train delayed our 10:20 departure out of Kalamazoo. A first-time experience for us both, I'd chosen this slower mode of travel to see the land at eye level, meet new people and see why railroad trips were becoming popular again. Knowing we'd be sitting most of the day, we walked up and down the platform for awhile, but each new announcement pushed the train's arrival back another half-hour. Eventually we ended up waiting inside with the other passengers, hoping we'd soon hear "time to board." 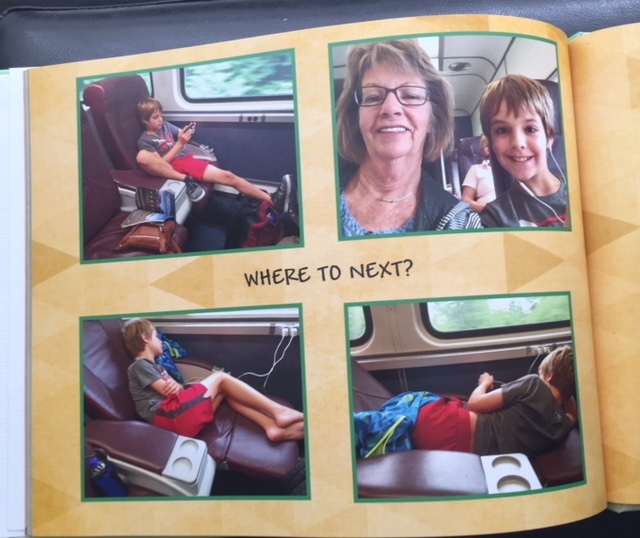 Ten-year-old Lane, one minute older than his twin sister, was next in line for his vacation with grandma. Each child gets a say in where we go and what we do. The older girls chose dog sledding in Alaska and sightseeing in New York City. By the time my older grandson was ready, he jumped at the chance to visit a friend's Montana dude ranch. For Lane, a TV reality show about building tree houses sparked the idea. Treehouse camping sounded fun to me too...something new to try with hiking and fishing to keep me active. After booking two nights in mid-June, I considered what else might appeal to intergenerational travel buddies. "Yes!" he shouted when I called and suggested sleeping overnight on a train. Another thing I'd never done....Amtrak here we come! On board Michigan's Blue Water, I realized we were riding backward and tried to switch our seats around. The man across the aisle noticed and kindly pointed to the rear of our car where the seats faced forward. Duh...this might have been my grandson's first eye roll. We moved our belongings and settled back to watch the countryside roll by. It was a never-ending panorama of crops about to sprout, grazing animals and an occasional quaint village. Two hours off schedule meant we were hungry, so we tapped our peanut butter crackers together and toasted "cheers to lunch!" Fred, a National Parks volunteer on board, entertained us with a verbal tour of Indiana Dunes National Lakeshore as we rounded Lake Michigan's sandy stretch of shoreline. Chicago's Union Station was crowded, hustle-bustle chaos; quite the opposite of a quiet, one-room waiting area. After emerging from the dark tunnel-like platform, we found our way to the Grand Hall. What a disappointment...it was temporarily blocked off with ropes and the walls draped in heavy plastic. Workers were completing restoration to the 1925 building due to water damage. 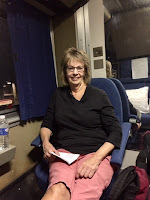 As we waited in area F for the Los Angeles-bound Southwest Chief, I chatted with a group of Amish folks headed to a gathering in central Kansas. Dressed in traditional heavy black clothing, they introduced us to their "important members," the elders who would speak at the event. "Grandma, do you have to talk to everyone?" my grandson whispered, reminding me this trip was for him. I gave the zipped-lips gesture and went back to my book. With premium fare status, we were called to the front of the boarding line and ushered to the correct track and train car. What a grand welcome! Our conductor greeted us by name and escorted us up a winding staircase to our sleeping compartment. Lane inspected the bunks, bathroom and closet while I kicked off my shoes and put my feet up. The rhythmic motion of the tracks beneath us signaled we were headed west to things unknown...the best kind of adventure! 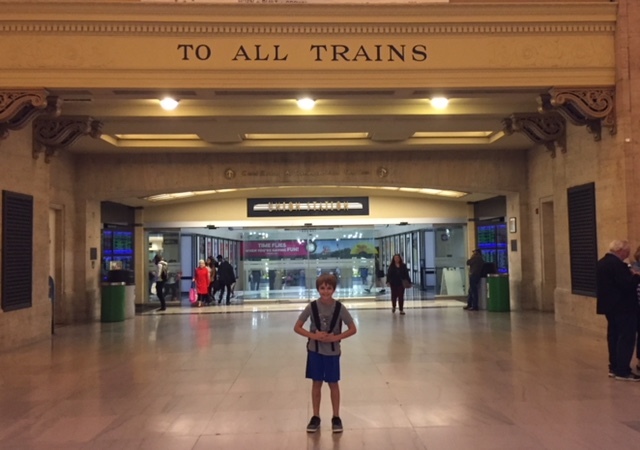 I was grateful to have this growing-up-too-fast-kid with me as we headed to the observation car to wait for our 5:30 dinner reservation. He likes figuring things out for himself...so before I could freak out, he nonchalantly pressed the black button that opened the sliding door connecting the moving cars. "Quick, Grandma....just walk through," he coaxed me as I hesitated too long mid-car. Whoops...the next door closed but he hit it again and I hurried past. Thankful I hadn't been trapped and muttering "be careful" to myself, I followed him through three more cars. I enjoyed a glass of wine and he a coke as we watched acres of agriculture whiz by through the giant wrap-around windows. "Do you know how fast the train is going?" asked the young Amish father sitting next to us. Seeing the blank look on my face, he added, "I don't have a cell phone, but you can use WAZE on yours." My brain was still registering they don't use modern conveniences but they know about cell phone apps when my grandson took charge again. He knew about this real-time transportation app, took my phone, asked my password and voila! 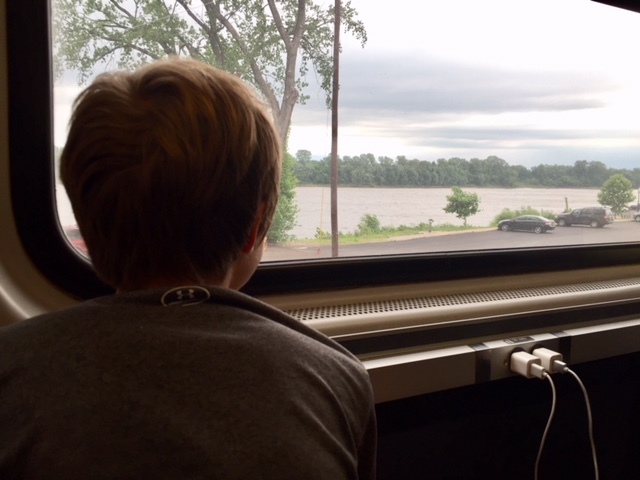 We all watched the speedometer waver between 80-85 MPH as the train sped through Iowa, crossing the Mississippi River at Fort Madison. Merrill, the dining room host whose deep soothing voice perfectly set the mood for an evening meal, led us to a white paper-covered table. We were joined by a couple from Pasadena returning from a Memorial Day performance in DC. Lane and I ordered the salmon dinner with mashed potatoes and broccoli. I was glad we'd changed into fresh clothes...it was a lovely atmosphere with delicious food, attentive service, a window view of Missouri and nice folks to visit with. Our beds were ready when we returned to our room and I was delighted to see the top bunk had a harness that held the sleeper in place. The toilet in our compartment had a powerful flush...the loud whoooshing could be heard over the clacking track and engine sounds! We decided tinkling would not warrant a flush, ensuring less of this scary sound. 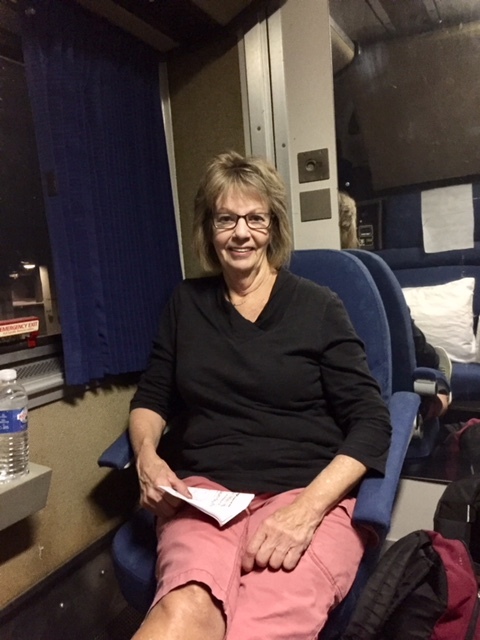 Lulled by the rockin' and rollin' of the the wheels along the tracks, we slept through the night, missing a chance to peek at Kansas under the stars. Rising at 6:00 gave us time to dress, eat breakfast and be ready to depart by 8:15 when the train stopped for a crew change in La Junta, Colorado. This was our first destination, an old western town in the southeastern corner of the state. It was 100 degrees already, luckily we had water bottles compliments of our conductor. We wandered the streets of the still-sleepy town, eventually finding a place that opened early...Daylight Donuts. What a friendly welcome as we ate donuts and listened to local knowledge from the town's early birds. Manager Kristen suggested we visit the library, try the historic Copper Kitchen for lunch and ask the Post Office folks to mind our backpacks. The librarian invited us to cool off and browse the shelves, happy to share Woodruff Library with day trippers. I caught up on past issues of magazines while Lane hung out in the teen area with zentangle design worksheets and comic-con costumes to try on. Postmaster Julie agreed to stash our backpacks behind the counter for a few hours so we could enjoy hot turkey sandwiches at the Kitchen and visit the shops along Colorado Avenue. It was a long day, but time passes quickly when you're in the moment, unanchored and free to be. That changed when Amtrak's text indicated our eastbound Chief was delayed...waiting time would drag. We grabbed a burger from Jodi's Grill and watched the sun slowly set with other passengers until the train arrived. It was late and we were grateful our roomette was ready. Sorry Kansas, but we slept really well again! Another morning, Another city! We awoke in time for pancakes and scrambled eggs again, then stepped off into Kansas City, Missouri. It was a follow-the-yellow-brick-road-sense of discovery as we walked through the enclosed, zigzagy skywalk from historic Union Station, over the streets and into the high-rise Westin Hotel in Crown Center. At 10:00 in the morning, not only was our room ready, but the box I'd shipped ahead was waiting for us. Clean clothes, a change of shoes and no packs on our backs meant a fresh new day to explore. We spent hours at Sea Life Aquarium, an afternoon swimming in the pool, and the rest of the day at Lego Discovery Center. The huge, rambling food and gift mall connected to the Westin offers a variety of places to eat and shop. But after a busy day and another early train to catch, we opted for the hotel restaurant, just a few steps rom the elevator. Morning brought a fourth day of discovery. 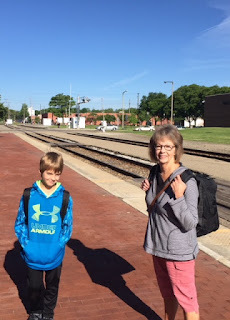 We grabbed muffins-to-go and headed back across the skywalk to board the Missouri River Runner to St Louis. Approaching the glass-and-black-bar-covered ticket window with a small opening to speak through, I asked the agent which line to get in. "No worries," he replied, pointing to a small area reserved for seniors and folks with disabilities. "We'll be taking you to your car in just a few minutes." As one of the oldest, I was delighted. As the youngest, Lane was given elevator duty, holding the door as the agent gathered us all on. He took us down to the platform level and onto a golf cart. The ride to our car seemed to take forever...there's literary no end in sight on cross-country trains. I purchased business class for the six-hour-ride to St. Louis. It was worth a few more dollars to have leg room, lay-down seats and room for both packs and duffel bags. Half the car held comfortable seats and the other half was a concession area with snacks and soft drinks. Lots of time for reading, relaxing and watching the river run along side us. St. Louis's Gateway Transportation Center is easy to negotiate. A covered platform led into the building, and signage guided us out the front door. It was a wet and drizzly afternoon, but our Lyft driver paused long enough for Lane to capture the Arch and Cardinal's Stadium through rain-splattered windows. The keys to my rental car were in the hands of TJ, the Westin bellhop who took time to explain details of the enormous SUV and give me directions to get out of the city and into Illinois. A quick left, right, left led to a spaghetti-junction-tangle of highways and across the Missouri River. I bought a booster seat for my backseat pilot and the travel gods lightened the rain and thinned the traffic. click here for Treetop Camping! You've sent me scurrying to Google Maps to see where your travels took you and rekindled my wanderlust. 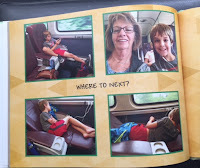 Thanks for sharing your train trip (and treehouse stay). How nice to hear from you! Glad you’re interested in wondering/wandering again!